The Moraceae — eften cried the mulberry faimily or fig faimily — are a faimily o flouerin plants comprisin aboot 40 genera an ower 1000 species. Maist are widespread in tropical an subtropical regions, less sae in temperate climates. The anly synapomorphy within Moraceae is presence o laticifers an milky sap in aw parenchymatous tissues, but generally uisefu field chairacters include twa carpels whiles wi ane reduced, compoond inconspicuous flouers, an compoond fruits. 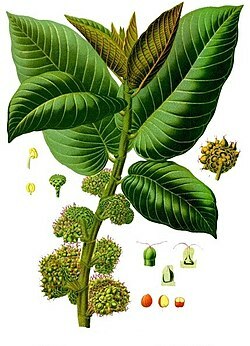 Included are well-kent plants sic as the fig, banyan, breadfruit, mulberry, an Osage-orange. The 'flouers' o Moraceae are eften pseudanthia (reduced inflorescences).